Making smaller size version of images (generating thumbnails) is common routine for many web users. You can make this process easy and quick using batch mode of free Sirius DogStar Thumbnail generator. You can customize different aspects of smaller image like size, background color, overlapping text, text font, output image format and much more. 1. Download Sirius DogStar Thumbnail generator program. 2. Install from the setup file & launch the program application. 3. 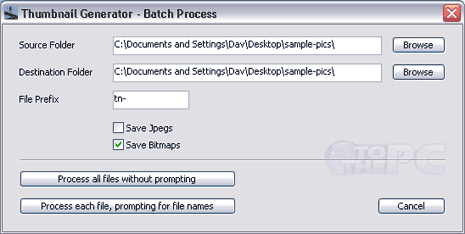 Click “Batch Process” button on the application window. 4. Click Browse to select “Source” and “Destination” folder. 5. Add file name prefix & check option for desired output image format. 6. Click “Process all files” button to get thumbnails of selected image files. 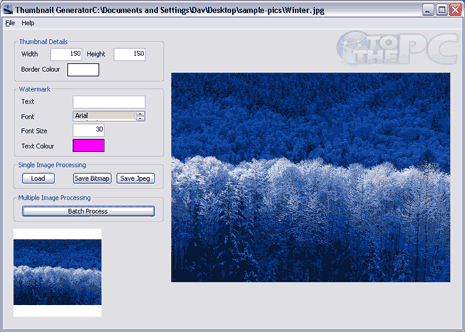 For sure one simple and easy to use Thumbnail Generator program for image processing in batch mode, try out!